Summary: What remains is a tried, tested and terminally dull American formula dressed up to appear Japanese. Full of Eastern promise or a cross-cultural catastrophe? The Last Samurai, Tom Cruise’s latest superstar vehicle, attempts to merge two heavily romanticised cultures, The American West and Feudal Japan, into the template of a rousing period epic. Cruise steps into the role of Nathan Algren, a damaged and decorated veteran of the Wild West who finds himself largely redundant in late nineteenth century America. With the Native American nations subdued permanently, the dirty work Algren carried out as a captain in the cavalry is complete but its bitter legacy haunts him daily. A heavy drinker, Algren makes a buck entertaining tourists as a sharpshooter in San Francisco, until an old colleague and sparring partner approaches him with an offer to help turn the antiquated Japanese army into a modern fighting force. Suddenly Algren finds himself the archetypal fish out of water in an alien land, saddled with the task of training a peasant army that is ill equipped and unprepared. Assisted in disciplinary matters by his cavalry buddy Zebulon Gant (Billy Connolly inexplicably trying to do an Irish accent and failing) and in cultural adjustments by British ex-pat Simon Graham (a beetroot cheeked Timothy Spall), Algren busies himself with the task at hand; displaying all the interest of a burnt out soldier who’s in it for all the Yen he can ship back stateside. Once Algren is forced to rush his troops into pursuing and engaging the rebellious Katsumoto (Ken Watanabe) and his Samurai the real ideological conflict begins. The Samurai, whilst still loyal to the Emperor, are the enemy of Japanese progress and must be removed for the country to move forward. With battle imminent, Algren is sober enough to spot the similarities between his current enemies and those he disposed of for Uncle Sam. The Samurai, like the Native Americans, embody a deeply mysterious and romanticised way of life, which they do not intend to rescind lightly. This realisation hits Algren when he is left alone on the battlefield surrounded by the corpses of his new, less-than-model army and a host of Samurai intent on killing him. Spared death by Katsumoto’s curiosity, Algren is taken prisoner and forced to observe the ancient Japanese rituals that the Samurai uphold. Required to come to terms with his pastoral captivity deep in the mountains, Algren discovers something of his self in his supposed enemy and a mutual respect develops. It is easy to be swept away with the alluring package that is The Last Samurai. The production is faultless; the scale and authenticity are neatly judged and director Edward Zwick handles the material passionately. Drawn again to this particular timeframe, namely the second half of the nineteenth century, Zwick adapts a loose revisionist western format to Japan. It is this easy to spot mould that severely restricts The Last Samurai, and curtails any serious attempt to explore the Japanese culture that the film purports to celebrate. The plot feels far too familiar and convenient, moving in an orderly fashion to an obvious resolution and Algren’s assimilation into the small Samurai community is charted with the inevitable period of self-loathing and contempt that then leads to mutual respect and trust. Within weeks he proves himself worthy by subjecting himself to Katsumoto’s philosophical ramblings, taking his shoes off before entering the house, eating dinner cross-legged and saving Katsumoto’s life. Cruise buys into the lifestyle wholeheartedly, short of picking his plot of land in the mountains, and sets about becoming another thorn in modernisation’s side. The culture clash that is generated at the heart of the plot is overused and too easily resolved, despite seemingly irreconcilable differences at the outset, thanks to the redeeming power of courage, loyalty and tradition; values that naturally transcend the superficial trappings of culture. These might appear to be worthy flagstones upon which to base an epic narrative such this, but it leads to The Last Samurai doing the classic Hollywood disservice to the culture it sets out to glamourise, primarily because it feels like Tom Cruise, is converting the Samurai to his code not the other way around. Too often Cruise, never forced to push himself, appears the enlightened one in the midst of a rabble of Samurai who do little more than grunt and look fierce. The intoxicating obscurity of ancient Japanese culture is shown to be irrational and confusing. Such a ham-fisted portrayal sadly limits the effectiveness of The Last Samurai as a weighty drama (oddly enough there have been Oscar whispers) despite this fact the film still operates very well as a spectacle. 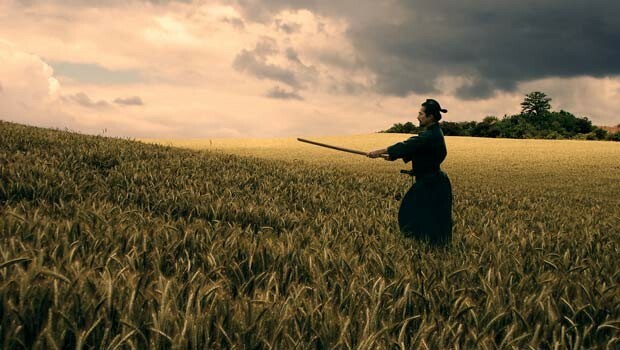 To say that the action scenes are worth the entrance fee alone, especially in the face of such remarkable recent opposition, would be an exaggeration but The Last Samurai is as well executed as a lightening slice to the neck from a warrior’s blade and proves to be a watchable venture east. The plot may be reductive and unwilling to take risks but the action sequences are quite the opposite; paraphrasing Akira Kurosawa’s giant battle scale in their style and composition. Sadly, obvious associations with a colossal American genre ensure that The Last Samurai always feels a little bit too close to home. The boat hasn’t been pushed out far enough in the story to match the films’ ambitions in other areas. What remains is a tried, tested and terminally dull American formula dressed up to appear Japanese.